Data Center Rack & Enclosure Market size is set to exceed USD 5 billion by 2024; according to a new research report by Global Market Insights, Inc.
Data center rack & enclosure market will experience a substantial growth over the forecast timespan owing to the rapid increase in the number of data centers globally. The rise in the number of enterprises has led to a high demand for high-performance facilities that cater to the growing needs of businesses. Increasing number of businesses and enterprises is replacing traditional paper-based documents with digital records to ensure ease-of-operations and the protection of critical information. The cabinets support the networking and IT equipment, such as routers, switches, networks, and networking equipment, in a facility. The demand for high-quality networking equipment from businesses will propel the data center rack & enclosure market. Technological advancements and the increasing adoption of IoT for various industrial processes are supporting growth of the data center rack & enclosure market. Rapid growth in cloud-based solutions, virtualization, enhanced data processing capabilities, high-performance computing solutions, and the requirement to expand the existing infrastructure are the key factors generating a high demand for the facilities. The enclosures offer advantages such as enhanced cable management options, airflow management capacities, security, and stability over open frame racks. Moreover, factors such as the rise in online activities that tend to generate large amounts of customer-related information, such as financial data, historical preferences, and related data, are causing companies to invest in the construction and modernization of new facilities, thereby driving the data center rack & enclosure market. The growing trend of digitalization has led to an increasing number of companies switching to such facilities for their data storage requirements. The growth in the IoT industry has led to a rise in the number of connected devices, thereby stressing the need for facilities to store the mounting volumes of data. Growing colocation, edge, modular, and green data center industry will provide an impetus to the overall data center rack & enclosure market. The trend of businesses shifting toward green IT and low power consumption systems has been witnessed in the industry. Expenses incurred by the companies for infrastructure cooling is making them focus on adopting high-quality server racks to reduce the overall energy consumption. The availability of a range of customizable enclosures in a variety of dimensions to meet user’s specific demands is anticipated to boost demand for the data center rack & enclosure market. 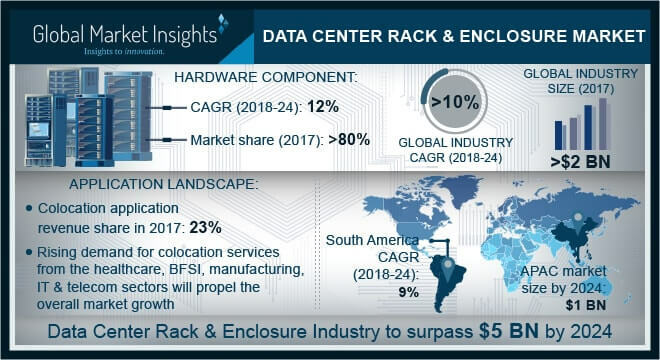 The hardware segment accounted for over 80% of the data center rack & enclosure market and will experience growth owing to the growing demand for high-quality infrastructure from several domains such as BFSI, healthcare, government, manufacturing, IT & telecom, colocation, and government. Infrastructural upgrading in the facilities and the growing importance for a high-density server environment are driving the data center rack & enclosure market. Moreover, increasing efforts directed toward ensuring rack level physical security are expected to aid the industry growth. Racks equipped with cooling systems are gaining significance owing to the growing demand for enhanced cooling solutions. The infrastructure operators are stressing on building sensors and camera-infused rack level security systems. The data center rack & enclosure market in Asia Pacific is projected to experience substantial growth and will reach USD 1 billion by 2024 owing to the rise in the number of businesses coupled with the shifting trend toward digitalization of all processes. Rapid urbanization in India, growth in the internet penetration, and the expanding telecommunication sector will lead to a mounting pressure to handle the increasing amount of data. In addition, the advanced electronics industry of Japan will provide strong growth opportunities for the Asia Pacific data center rack & enclosure market. The proliferation of technologies, such as AI, IoT, and cloud, in the manufacturing sector will further contribute to the demand for innovative infrastructure. The data center rack & enclosure market has some chief global players including Hewlett Packard Enterprise, Rittal GmbH & Co. KG, Schneider Electric, Dell, Eaton Corporation, Vertiv Co., and Emerson Electric Co. Companies are trying to expand their market presence by launching new solutions and acquiring businesses to expand the product portfolio. In February 2018, Rittal announced the launch of a line of LED lights designed specifically for server and network enclosures. Key players focusing on the R&D of these facilities will contribute to the industry growth. Companies trying to establish a new and modernized infrastructure will provide attractive opportunities for the data center rack & enclosure market. Regulations, such as European General Data Protection Regulation, are making operators focus on ensuring a robust physical security.